April 27 | 11:00 - 1:00 pm 1266 S Madison Avenue, Greenwood IN 46142 Come meet the Real Horse Soldiers that the move 12 Strong was based upon and get your bottle signed! 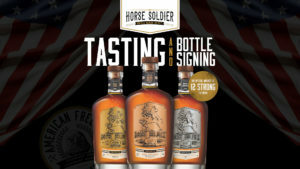 Learn More about Horse Soldier Bourbon in our Latest Blog. April 27 | 2:00 pm - 3:30 pm 9520 Uptown Drive, Suite G, Indianapolis, IN 46256 Hey Indy time to git your engines revving! 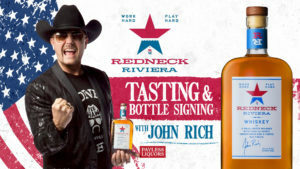 John Rich is headed to see y'all for a Redneck Riviera Whiskey bottle signing! Come by and say hey and have a bottle personally signed! 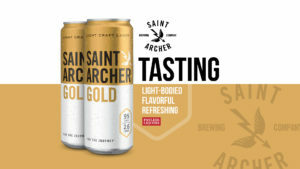 April 27 | 5:00 - 7:00pm 4924 S Emerson Avenue, Indianapolis, IN 46203 Saint Archer Gold is a Helles-inspired Lager. At 95 calories and 2.5 grams of carbohydrates per 12oz serving, this is a sessionable option. Craft beer quality with lower calories and carbs! Come give is a try.